Good morning. My name is George Leano and I am a co-lay leader in Nichigo bu and many of you may know me as Mary Leano’s husband. She was addressed a few times during last week’s Compassion Sunday service. I am pinch-hitting for our pastors who are in Yosemite where our church family camp is being held this Labor Day weekend. For those who are here for the first time, I must throw out a disclaimer that our pastor’s messages are much enlightening than mine. Many people experience challenging environment not only to become a Christian, but to continue with growth in faith. I am from a tiny Japanese island or Ryukyu Island of Okinawa located in between mainland of Japan and Taiwan. If you zoom in the island in Google Map, it looks like a big island but when you zoom out to see its relative location to the U.S., it becomes just a spec on the map. 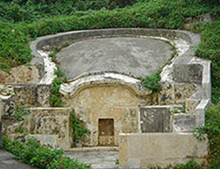 If you have a chance to visit Okinawa which some of you may already have, you will notice turtle-back shaped tombs even from a main highway. They are everywhere. In each tomb, there are cremated remains (not ashes) of ancestors from a line of individual family. On my mother’s side, Oyadomari family has a tomb in the south of the island where my ancestors’ cremated remains are kept. Once a year in April, there is a day of honoring our ancestors called “shii mii” which each family is obligated to visit their family tomb. As a child, I remember helping to clean around the tomb pulling weeds out since the adults won’t let me handle sharp objects like sickle to cut grass. Once the cleaning is done, a feast is brought in front of the tomb and offered to our ancestors. And then the best part, we get to eat afterwards. Also, many Okinawan households have a “buchi dan” (butsu dan in Japanese) with ancestors’ name plates on “tou tou mei” or a plaque. This is where one would pray to their ancestors at home. Many Okinawans also rely on “yuta”, a so-called fortune teller. Although from my experience, they are more than a fortune teller. Okinawans typically ask for yuta’s advice for anything from information about their future spouse, who they will be marrying in the future to their health conditions. When my mother looked for an apartment, almost always, she would have a yuta check it to see everything was okay before she signed a lease. Many Okinawans also practice Buddhism and my mom at one time was a Buddhist. So worshipping ancestors, having experienced yuta, Buddhist influence, and other Okinawan beliefs were not conducive to become a Christian. However, my mother was a single parent and very frequently, she did not conform to typical Okinawan traditions. Instead of sending us to a Japanese school, she sent my two older sisters and me to a Christian school started and run by evangelical missionaries. Interestingly, this school was built on a top of a hill where a fierce battle was fought during WWII. The hill was called Hacksaw Ridge which some of you may have watched the movie. It is be-fitting that a Christian school, which teaches love and peace, stood on this en-battled hill. The name of this school is Okinawa Christian School, OCS for short and now they have added “International” at the end. During one of my elementary years, I accepted Christ and became a Christian. Daily teaching of Bible was part of our mandatory curriculum and every Sunday, one of our teachers would pick me up in the morning to take me to church. After Sunday school, as I clearly remember to this day, we would listened to a comical, but effective pastor, Pastor Taylor, preach. The school and the church were where I was building my Christian base. Against all odds as my chances of being and staying a Christian in Okinawa was slim in the environment I was in, I felt blessed to have an opportunity to attend school centered on Christian faith and helped make my Christian base much stronger. But, my challenges would not end there. I was immersed into more challenging environments. When I was in a second year of high school at OCS, I left Okinawa to live with my oldest sister and brother-in-law in Indiana. I started making new friends and soon afterwards, I felt as though I was living in a sheltered life. I stopped going to church and selfishly, spent my Sunday mornings sleeping in and hanging out with my friends or watching football games. When I started college, I even became more detached from God especially after joining a fraternity. From the movies many of you might have seen, “frat” brothers do wild and stupid things. They are nothing like that. They are worse. There were more times in my life I went astray, but God would always find His way to reel me back in, because I had my base. And, again, I would steer myself back to church where I can re-construct my fragile base. Almost 9 years ago, my wife and I moved to the Bay Area from a Chicago suburb. After we settled, we tried different churches including Wesley, but we just couldn’t find one that we felt we can make it our church. In 2012, after a year of house hunting, God blessed us with a house near downtown San Jose and not far from Japantown. So, we decided to give Wesley another try. And today, I attend this church with many who can and have helped me with refining my base, my foundation. One main influence that transformed my base was Rev. Hajime’s dedication to serving our Nichigobu and Eigobu members. He has empathized, comforted, and advised even non-Christian seekers and strangers. One time, with his knack of persuasion, we got talked into hosting an unexpected visitor from Japan, Toru, whom we impacted his life by showing what we Christians do for others. Some of you here met him and helped him too. This was over a year and a half ago, but to this date, he keeps in touch and still appreciates what we have done for him. Also a couple who are good friends of my wife and I are seekers and I look forward to help them to get to next steps. We also have mother and son attending our church since their involvement with ministry through Japanese class we held here at Wesley. Rev. Hajime has given me these opportunities to contribute and added a few more bricks to my foundation. I believe our Christian base gets adjusted, as we grow in our faith. As I summarized my base now, it contains pretty much the same principals as the ones Wesley teaches. Love God and love one another which also include helping those who are in need and doing no harm to them, excluding no one. 1 Thessalonians 5:11states “Therefore encourage one another and build one another up, just as you are doing”. Let’s remember to encourage others not only in bad times but in good. Let us help each other to grow our Christian base, our spiritual foundation together.